Denim and cozy vibes are all I want this season. Now that I have transferred to a much larger school, I know the need to be comfortable as I walk upwards of 15 minutes to some classes is not only practical, but necessary. I haven't had to endure as many hills as I did on Lehigh's mountainside campus, but the University of Wisconsin is multitudes larger than Lehigh and I'm not used to being forced into a half-sprint just to make it to a different hall on time. 1 // A boss jacket that just happens to be in French (salut! French minor over here!) and UW's colors. 2 // A classic striped tee with a quirky embroidered twist. 3 // A cozy henley/sweatshirt combination that could be paired with jeans and booties or dressed down with leggings and sneaks. 4 // A cream sweater. You can never have enough of these. 5 // Who knew hoop earrings would ever come back in style?! I love this simple pair because they are the perfect mid-size while being a little different (they sit right on your ear instead of loop around!) and this drop down pair because the thicker, shinier gold feels so autumnal to me. 6 // A camel bag that combines all of my favorite things... suede, leather, an around $100 price tag, a cute shape, and metal details. 7 // A cool pair of boyfriend jeans. 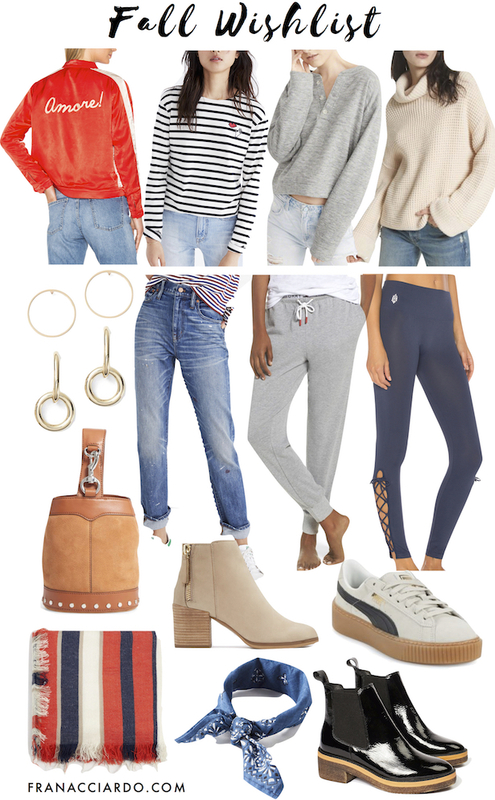 8 // Comfy joggers for lounging around but maybe even sporting to class on those days when you can't make a "real" outfit happen. 9 // Leggings that aren't your average pair. 10 // Heeled booties in the perfect, flattering height, shape, and color. 12 // Patent leather ankle boots that stand out among everyone else's leather pairs. 13 // A versatile patterned bandana to tie on your bags, as a bracelet, or around your neck to spice up a simple outfit. 14 // A big, striped scarf in fall's palette to keep you cozy for these few months.